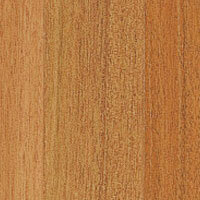 The sapwood of andiroba is pink when freshly cut but quickly turns to a pale grayish-brown after exposure. The heartwood is reddish brown when freshly cut and dulls slightly in shade with age. The species has a straight and sometimes interlocked grain and is medium to somewhat coarse in texture. Andiroba is reported to have no odor, dries easily, and has excellent dimensional stability characteristics. As a flooring option, andiroba is a hard and durable wood. This species is almost thirty-six percent harder than cedar, is just under one percent softer than either movingui or heart pine, it is roughly ninety-four percent as hard as red oak, roughly eighty-four percent as hard as hard maple, and is about two-thirds as hard as either hickory or pecan. Andiroba is relatively easy to cut and shows only slight dulling effects on tools. The wood has a tendency to split under nailing, however, making pre-boring a necessity. Screws hold well with andiroba flooring. 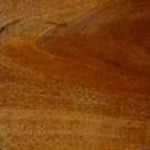 This species is reported to take stain and polish well. Some of andiroba’s uses include interior construction, cabinetry, veneers, furniture, and stairworks.